Through the Rotary District 1010, a Vocational Training Team Project is currently underway and require business mentors to give service in a developing country. 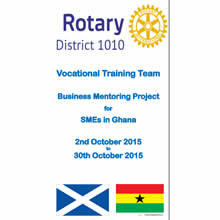 The objective is to provide mentoring and business support to a number of small businesses in the Kumasi area. A team of around eight business mentors are being sought, who have specialist skills in a range of areas ie marketing and IT. They will work in conjunction with the mentors and also provide a seminar programme for the wider business community in Kumasi. The project will be fully funded by The Rotary Foundation, subject to a successful grant application. The project is due to start on 2 October 2015. For further details, please click here to download the leaflet, which provides contact details. Please note non-Rotary members are also encourage to apply.